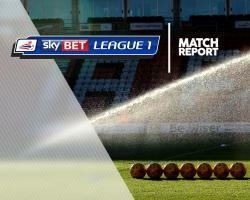 MK Dons secured a top-half finish in Sky Bet League One with an emphatic final-day 4-1 victory at fellow mid-table outfit Walsall. The visitors took the lead on 11 minutes as Robbie Muirhead collected Harvey Barnes' ball over the top and lashed a fierce low finish past Walsall goalkeeper Craig MacGillivray from 15 yards. Walsall went close to a leveller on 27 minutes as George Dobson's free-kick caused confusion in the Dons box but Kory Roberts' close-range header was tipped over by Lee Nicholls. Dons doubled their advantage on 33 minutes with another sweet strike, Ben Reeves cutting inside and curling a fine 20-yard left-footed effort into the bottom corner from the right-hand edge of the box. They added a fortunate third goal 20 minutes from time, Stuart O'Keefe credited with it as he unwittingly deflected Ben Tilney's long-range strike past a stranded MacGillivray. Erhun Oztumer pulled one back for Walsall on 84 minutes, drilling home his 15th of the season from 20 yards, but Barnes rounded off the rout with a deflected strike from 12 yards a minute later.